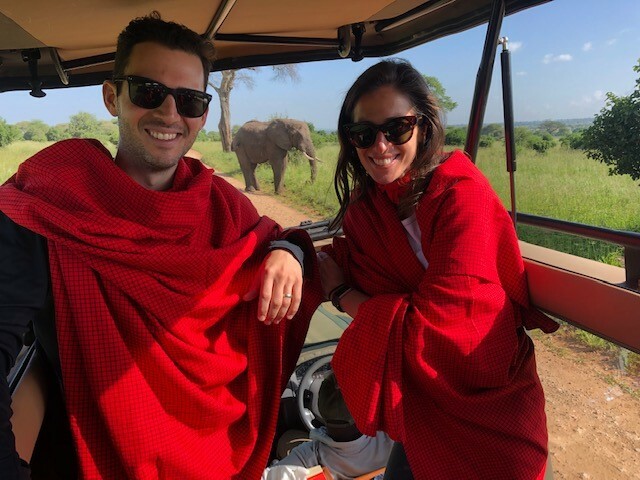 We spent yesterday touring Tarangire National Park which is home to many elephants, in fact, it has more per square kilometer than any place on Earth and it didn’t disappoint. There was one point when there was around 150 elephants within just a few hundred feet of us. There were plenty of other animals as usual, and we got close to a few big giraffes, which was pretty cool. We ended our day at a remote and off grid camp within the National Park and surrounded by wildlife. The camp has screened in rooms that allow the night sounds and smells of Africa in. It’s been a memorable experience for everyone and great friendships forged. But finally it’s time to return home to our families. 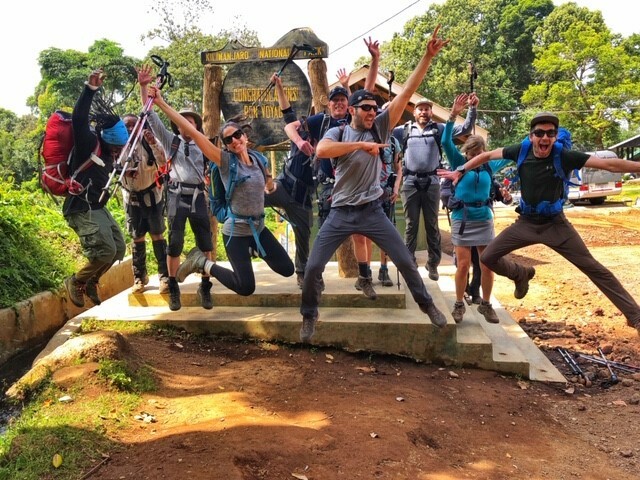 RMI Guide Casey Grom and the Safari crew! Wow, what a great experience and memories made to last a life time!! Thanks again for sharing! 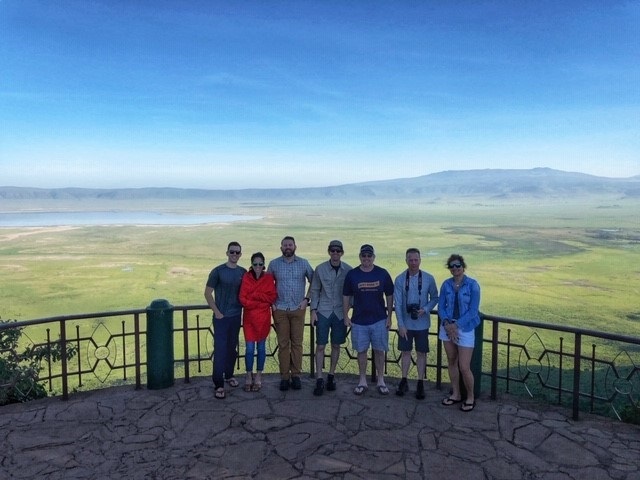 Today we visited the famous Ngorongoro Crater. The crater is roughly 100 square miles and is known for its abundance of animals that call the crater home. We hit the road early with hopes of catching a few of the big cats before the heat of the day. There were many sightings today of hyenas, jackles, ostrich, and countless other birds. We didn’t manage to see too many Lions, but did get to see 3 Leopards while driving in and out of the crater, which was certainly a highlight. We saw several Black Rhinos which have become very rare do to poaching, however, they were only viewable through binoculars. We wrapped up the day with a visit to a Maasai village not far from the craters rim. The Maasai people are a semi-nomadic tribe that exist almost entirely off of their cattle. The team spent time asking questions and enjoyed being shown around their small and simple village. Today was our first day of safari and we visited the beautiful Lake Manyara. The lake is a brief stopping ground for many migratory animals and home to more than 300 different birds. The birds were nearly of every shape and color you could imagine. 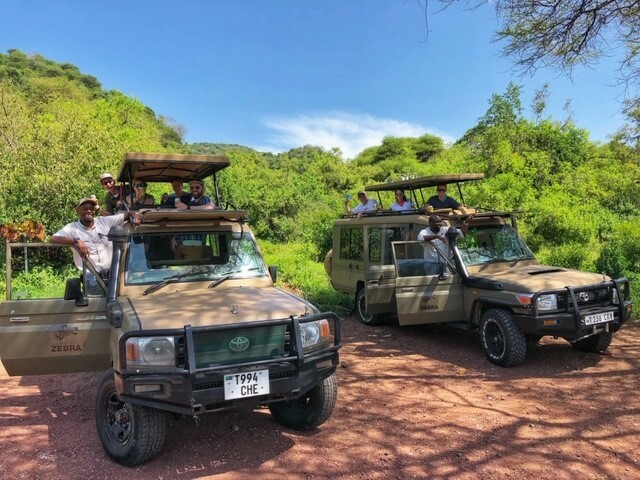 Everyone enjoyed the day cruising around in our safari vehicles with cold beverages in hand while seeing the animals. 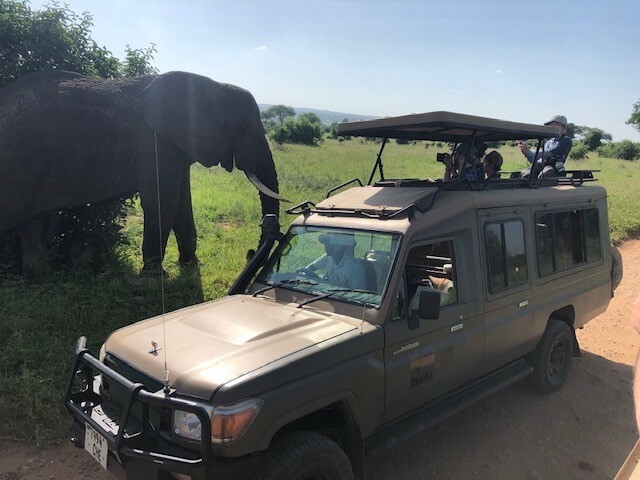 We manage to see a few wildebeest, zebras, Cape buffalo, lots of baboons, a few impalas, several elephants and even managed to get pretty close to a few lions. 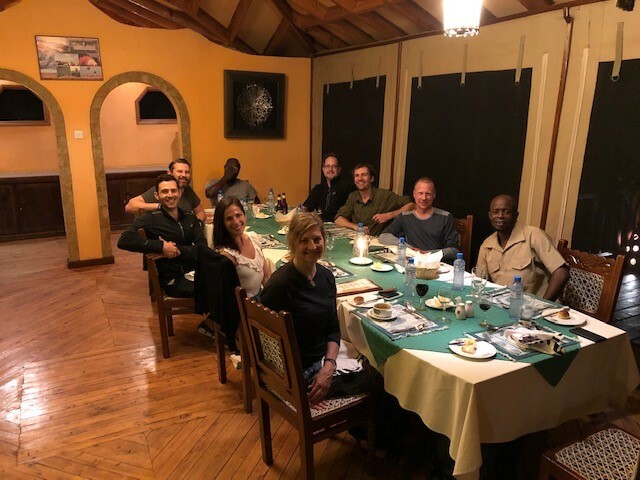 It was a nice introduction to the incredible diversity of wildlife that Africa has and the team is looking forward to seeing more tomorrow. 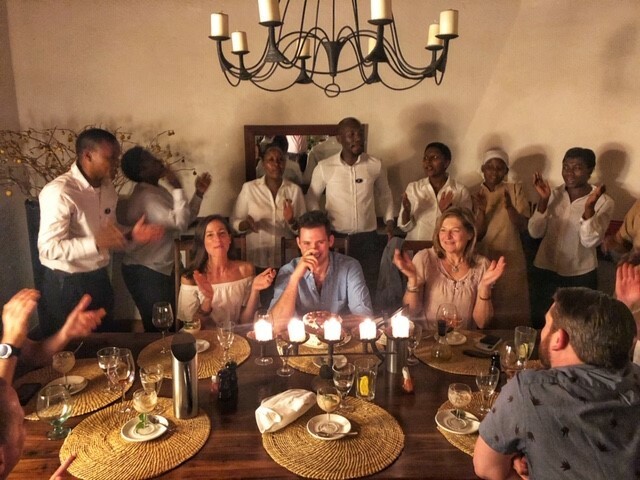 We wrapped up the evening with a wonderful meal at our new lodge, The Plantation Lodge. and even celebrated one of our teammates birthday with a cake and plenty of singing. First - HAPPY BIRTHDAY SON! What a Birthday Celebration. One we are sure you won’t forget! 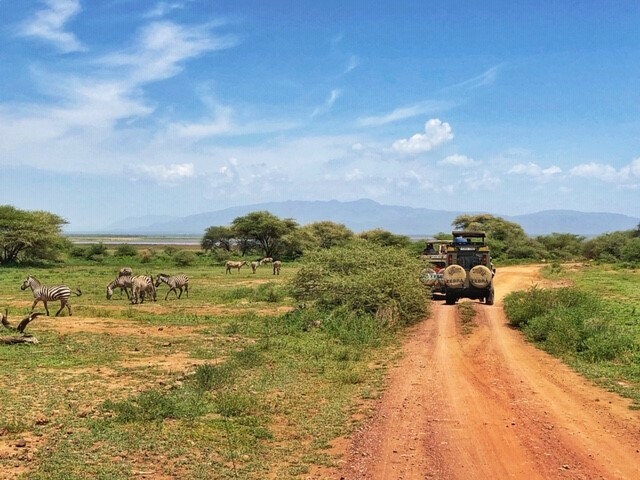 A little easier cruising in a Safari vehicle then trekking the mountain? Enjoy this leg of your incredible Honeymoon. 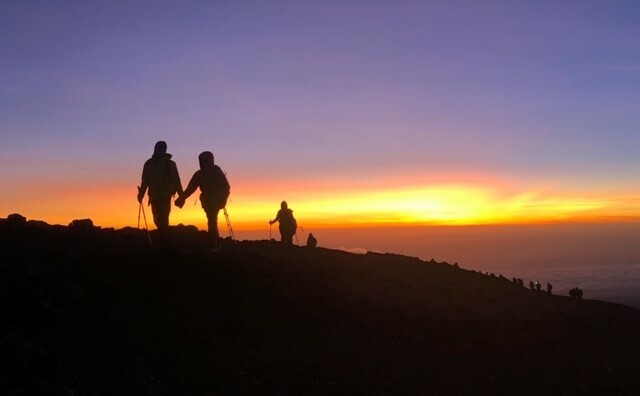 Yesterday we had a wonderful albeit long day climbing to the summit of Kilimanjaro. The team woke at 11pm to thankfully clear skies after a very cloudy evening that had us wondering what lay ahead. We had a quick midnight breakfast of porridge, tea and coffee before hitting the trail at midnight. The weather turned out to be pretty nice with just a little bit of wind, but it was a little chillier than previous climbs. The climb took about 6 1/2 hours to reach the top, and thankfully the sun had risen shortly before reaching the top to help warm us and boost morale after climbing through the chilly night. Once there, we hugged each other, enjoyed the view and took plenty of pictures while we waited in line to get our photos of the sign that adorns the summit. It was a true test of endurance for most of the crew, and I’m really proud of everyone. 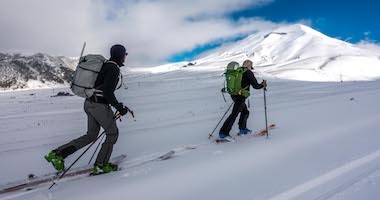 We descended back to high camp, had a quick lunch, repacked and continued further down the mountain to our final camp on the mountain, where we had dinner and then headed to bed for some well deserved sleep. 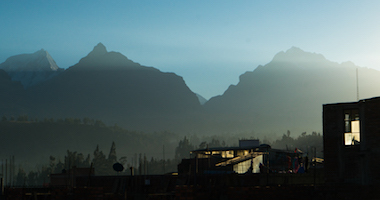 Today we woke at 6:30 feeling good, had breakfast, then enjoyed a goodbye song and dance from our gracious crew of porters, cooks, and local guides numbering 48. We finished the little celebration by handing out their well deserved tips and then hit the trail one last time. It took a little over three hours to reach the park gate where the team had lunch then hopped aboard our awaiting bus for the ride back to the lodge. Finally we are all safe and sound, and a little cleaner after an amazing seven-day journey up and down Kilimanjaro. 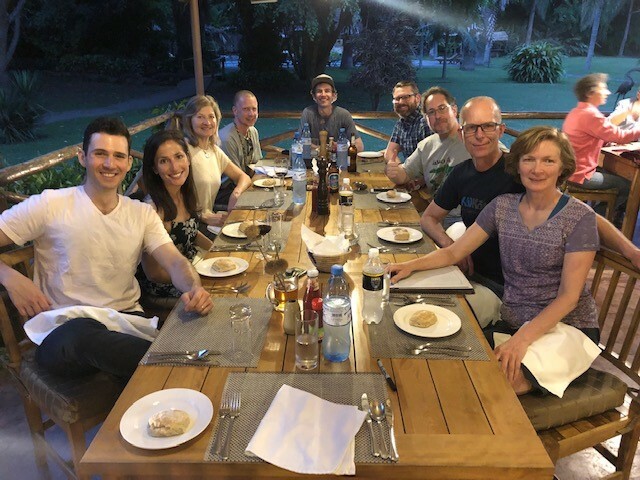 The team is currently relaxing and looking forward to Safari which starts tomorrow! Sadly, the sat phone was too cold and died as soon as I turned it on. Bummer. 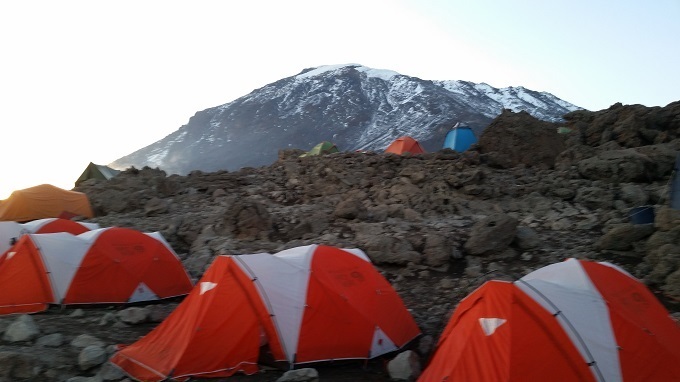 We are all safely back at High Camp after a cold climb of Kilimanjaro. Short break here before we head down to our last camp. Can’t wait to share pictures. CONGRATULATIONS TO ALL. Can’t wait to see pictures and give you hugs. Enjoy the rest of of the adventure. Way to go, Joe! Congrats to all of you on the expedition. Safe travels coming back! Well we’ve finally arrived at our high camp, after a good night’s rest and a short hike up to 15,000ft. 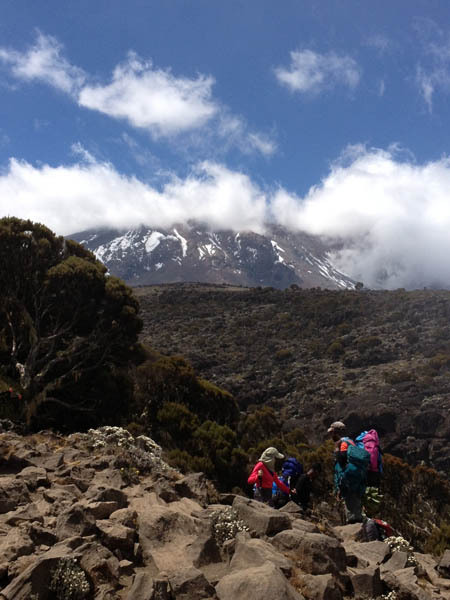 It was mostly sunny all day with great views of Kili and our climbing route for tomorrow. The team is doing great and feeling well at this new altitude which is a good sign for things ahead. We’ve just wrapped up lunch and discussed in great detail the plan for tomorrow’s climb. Everyone knows what we’ll be wearing and what will be in the pack as well as the schedule. Our game plan will be to wake at 11pm and have a quick breakfast at 11:30, then hopefully hit the trail right at midnight. 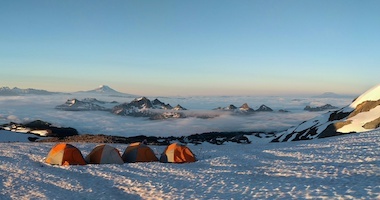 I’m expecting the team to reach the summit in seven hours or so if things go according to plan, and if the weather is in our favor. 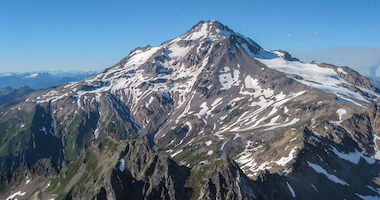 The team is planning on making satellite phone calls from the summit to loved ones back home. So if you have a loved one with us please keep your phones handy and if you receive a call from a strange number please answer. We are all sending good thoughts your way for tomorrow! 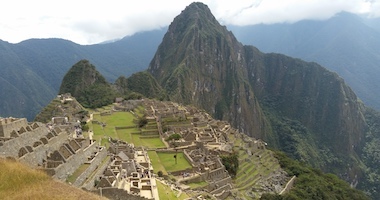 We had a slower start today to allow the many porters to hit the ever narrowing trail. Right out of camp we were faced with the only real technical obstacle right out of camp. This hurdle is the great Barranco Wall, which rises about 1,000 feet and looks as intimidating as it sounds. Thankfully there is a nice narrow trail that weaves its way up and through the wall and all the way to the top. Most of it feels more like steep hiking, but there are a few places that require the use of our hands to help us climb up. The team did a good job of moving steady and allowing a few porters through with their loads precariously balanced on their heads. Which was astonishing to see! After reaching the top we took a nice break and enjoyed the amazing views of the ice-ladened south face and valleys below. The team continued our hike for a few more hours up and down through a few valleys before reaching camp. 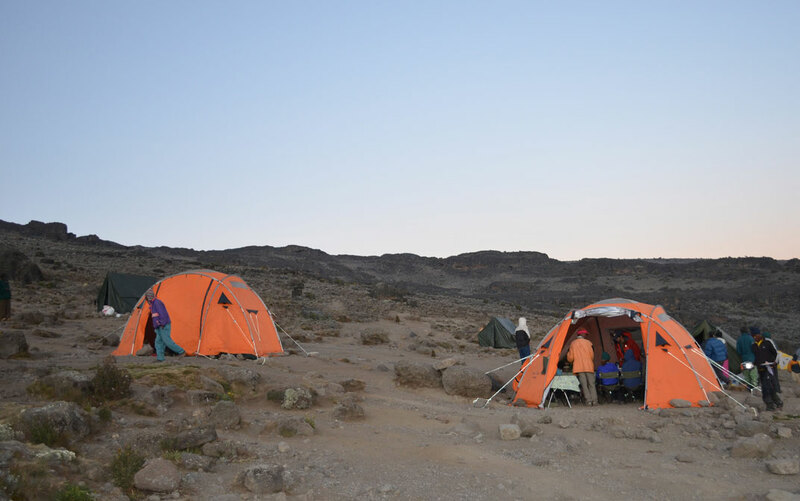 All in all, it took only about four hours for us to reach our next camp called Karanga, named for the big and beautiful valley which it overlooks and the peanuts that are grown far below in the valley. We spent the remainder of the day relaxing and playing cribbage, which has been quite the hit. Wow. Climbing that rock wall is more like crawling up. Wicked.! Wishing you all the best the rest of the way. Godspeed !! 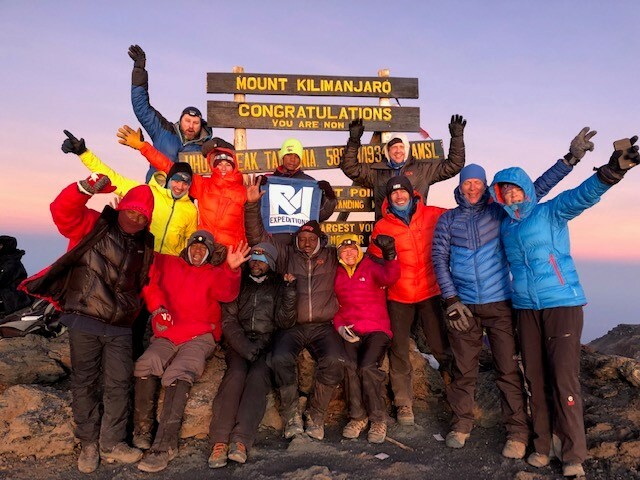 All is well here on Kilimanjaro! 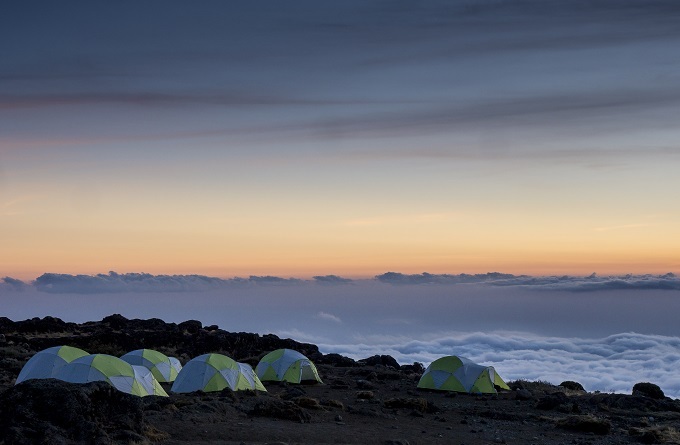 Once again we woke to beautifully clear skies with even better views of Kili and clouds obscuring the valleys below. Our morning ritual has been waking around 6:30 and getting everything in our tents packed up before heading into our very spacious dining tent for quite the feast. It was a bit chilly this morning, but soon enough the sun had us hiking in just our light layers. We hit the trail once again around 8am and hiked for an hour before taking our usual 15 minute break, then back on the trail for another hour. All total today we hiked for just over six hours before reaching camp which is set up and ready for us. Eventually the clouds rolled in and obscured the mountain for the final few hours. Along the way we passed around the famous and beautiful Lava Tower reaching just over 15,000ft setting new altitude records for some of the team. Everyone enjoyed the day and there was plenty of good conversations amongst the crew. All in all it was a really nice day! 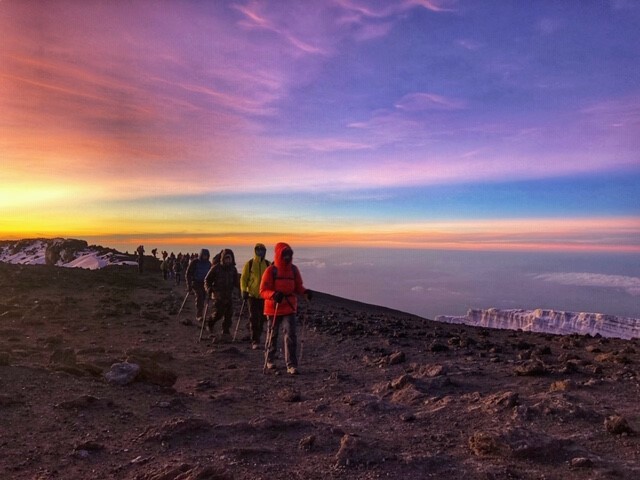 We had much better day day on Kili today, thankfully waking to mostly clear skies. Seemed like everyone slept pretty well after a bit of exercise and 9hrs of tent time too. 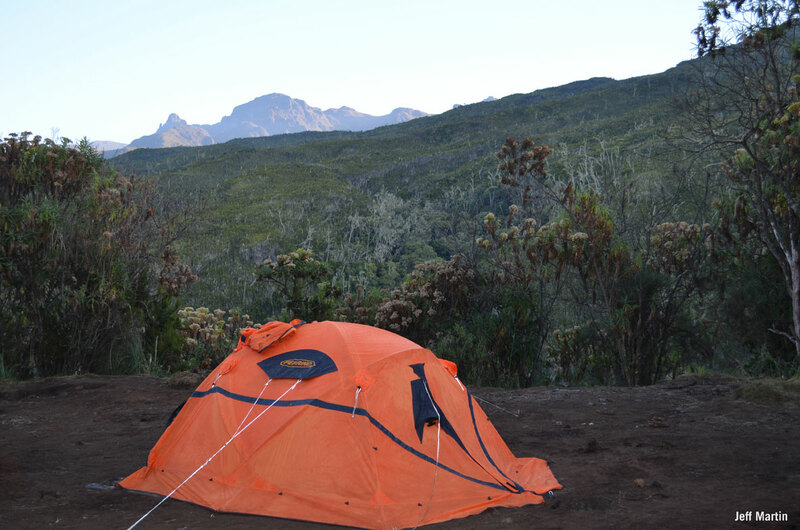 We started the day waking at 6:30 to begin packing up before moving into our dining tent for a nice breakfast with porridge, fried eggs, toast, avocado and even some fresh fruit, and most importantly plenty of hot coffee. We hit the trail shortly after 8 am and slowly made our way up the rocky trail that leads out of camp in the warmth of the sun. The trail climbs up a old volcanic ridge and eventually out of the trees and allowed for some nice views of the valley below. 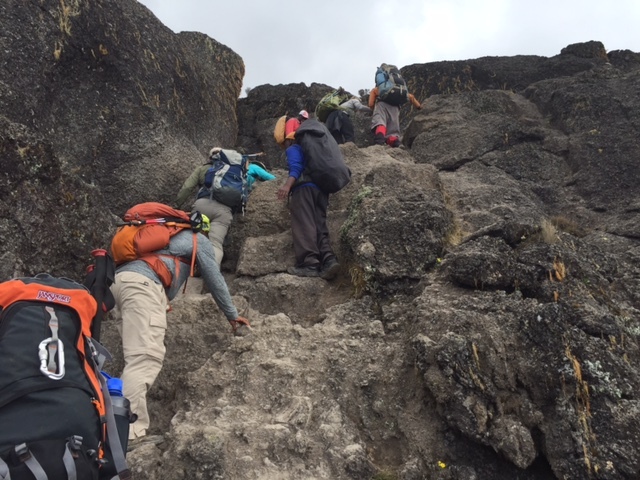 The team hiked for about four hours before reaching our next camp that sits on an old lava flow called the Shira Plateau. This plateau which formed a few million years ago sits just above tree-line, it was a bit cloudy when we arrived, so we had to wait till almost dinner to see some of the view and of course Kilimanjaro looming above us. Once settled at camp we were treated to a nice warm lunch and then hopped into our tents to relax. The evening was full of great stories and another amazing dinner prepared by our more than gracious staff. Good job team!! With you every step of the way!! 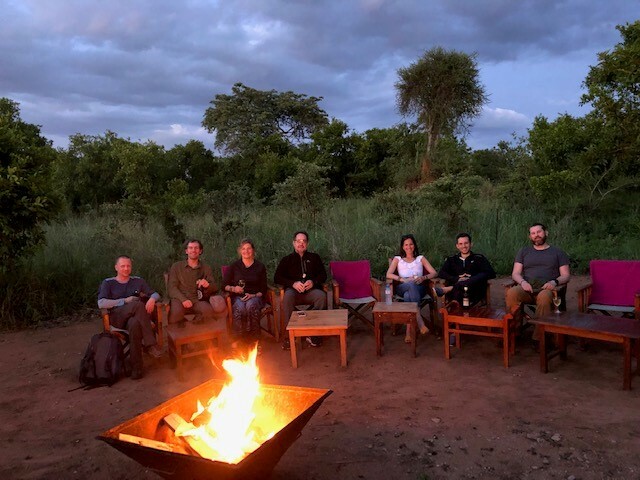 The team got off to a moderately early start this morning leaving behind our beautiful lodge and have headed to the mountain towards the start of the climb. We left around 8am and drove along the rural country side and small villages for two hours to reach the park entrance. Most of the area surrounding Kilimanjaro has been cultivated and primarily used for coffee production and for a variety of other agriculture needs, but there are still some areas that have been untouched and resemble more of a savannah that Tanzania is known for. 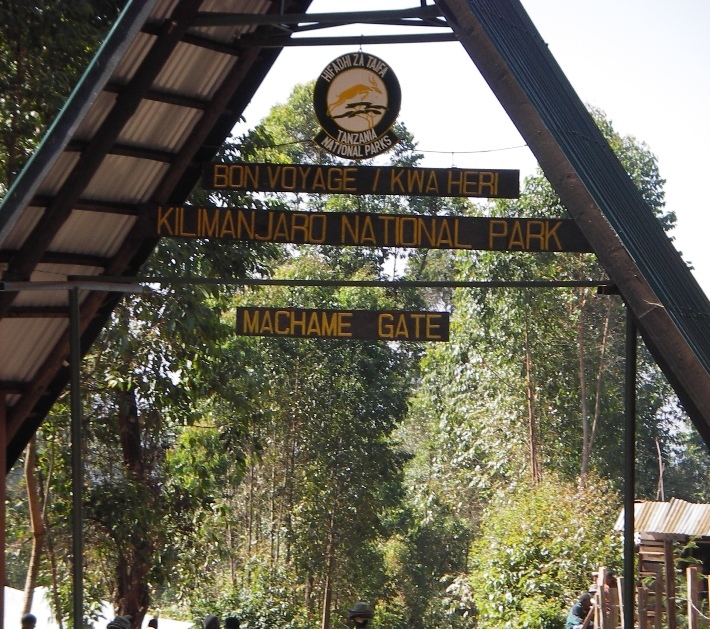 The base of Kilimanjaro is more forested and looks more jungle like and is called a cloud forest. Once we arrived at the gate we had all of our gear weighed and divided into loads for our 48 porters and other staff to carry before hitting the trail. Once everything was in order we started our climb slowly making our way up the winding trail that ascends continuously through the thick forest. The canopy is quite dense thankfully, which provided some cover from the rain that arrive around midday. The team hiked for a little over five hours and managed to not get too wet before we reached our camp for the night that sits around 10,000ft. After settling into camp and getting situated, the team was served a nice warm meal for dinner consisting of soup, rice, potatoes and steak. Everyone is doing well and looking forward to a good night’s rest. 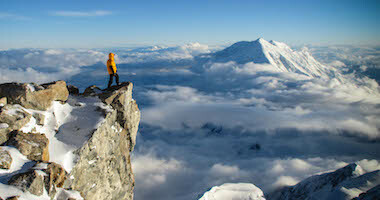 Happy climbing…..wishing you good weather and sure steps on this wonderful adventure . Keep us posted. Godspeed ! Wishing you a safe and exciting adventure, thanks for the updates! !